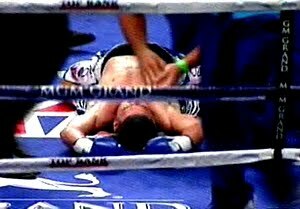 Juan Manuel Lopez wins by Technical Knock-Out. Juan Manuel Lopez (Puerto Rico), who has been the favorite since day one of the matchup campaign, was able to defend his WBO featherweight championship belt against the challenger Rafael Marquez (Mexico) during their November 6th match at the MGM Grand in Las Vegas, Nevada. The fight was stopped at the end of round number eight.